Djibouti discusses with CMA CGM the development of a new container terminal at an initial cost of USD 660 mln, informs Reuters. Speaking on the sidelines of the Africa CEO Forum in Abidjan, Ivory Coast, on Tuesday, March 27, Aboubakar Omar Hadi, Chairman of the Djibouti Ports and Free Zone Authority (DPFZA), told Reuters that the authority hopes to award the concession in July. It is also ready to buy out DP World’s stake in an existing container terminal to end a row and avoid arbitration. But DP World says that up to now, no offer has come from the government of Djibouti. As we wrote earlier, following the expropriation of Doraleh Container Terminal (DCT) from DP World, which the Dubai port operator declared “an illegal seizure”, there appeared speculations that the facility may be given by the government to China as a gift or to pay out the loans granted by the Export-Import Bank of China to Djibouti for infrastructure development. These reports were backed by the fact that China Merchants Port Holdings Co. Ltd. already holds 23.5% of Port of Djibouti S.A., the parent company of DCT. 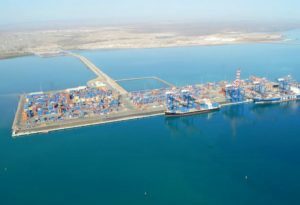 However, Djibouti dismissed these speculations saying that a new public company – Societe de Gestion du Terminal a Conteneurs de Doraleh – was created to take over the activities of DCT, with the State of Djibouti as the sole shareholder. And now Aboubakar Omar Hadi confirmed that the port authority was not in talks with any other potential partners. The project involves the construction of a new container terminal, that could break ground as early as September and be completed within 24 months. Once operational, the facility will have an annual capacity of 2.4 mln TEU, which could be expanded up to 4 mln TEU. The capacity of the current container terminal at Doraleh is 1.25 mln TEU, according to DP World. “We are targeting trans-shipment,” Hadi said, thus reaffirming the State’s plans to develop the port into a major transshipment hub in the Red Sea. 15% of the project’s cost will be financed through equity. Of that, the DPFZA will contribute 85%, with its concession partner providing 15%. The rest will be raised via international institutions and banks. According to Reuters, CMA CGM declined to comment.